When we talk about aging wine, rarely do we realize just how recent a phenomenon wine aging actually is. As mentioned in a previous post (Fun Wine Trivia), wine was not originally stored in bottles. And when wine was not transported in animal wineskins, it was stored in large clay containers and secured with sealants called terracotta amphorae. While these 7000+ year-old clay jugs were kept in cool places, evidence suggests the wine inside was not aged nearly as long as most bottled wine is today. In fact, when wine was later stored in wooden barrels for the first time, it was “aged” for a possibly shorter period of time. Depending on the barrel’s construction, sometimes a wine’s barrel life was just long enough to transport it to its final trade destination before spoiling. It was only when glass blowing technology was re-perfected (c.a. the 18th century) that glass bottles with smaller bottlenecks allowed for airtight wine storage. This is when it finally became possible to age wine in the tradition we follow, today. Interestingly, while the English were the first to seal wine bottles with cork, wine bottles were not the first bottles to be corked. Medicines, beer, and bottled beauty products benefited from corks long before wine! Since aging wine is a recent development (relatively speaking), it’s amazing that the art of wine aging has been perfected to such a fine degree so rapidly. We now know so much about optimal temperature control, humidity levels, and harmful UV rays, that custom wine cellars can be designed to optimally age any collection of wine. 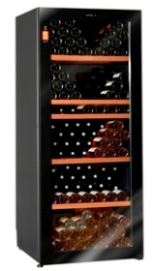 And many wine storage units, like the Climadiff Diva 265 Bottle Multi-Temperature wine cabinet, even have UV-resistant doors. Perhaps the most exciting thing about aging wine is that, just when we think we know all there is to know about it, some new discovery or innovation makes us think again: a new way to preserve wine, a new way to seal bottles, or new scientific information that allows for even greater precision when aging wine for optimal taste. For more fascinating information about the history of wine aging, check out Vintage Cellars’ The Science of Wine Aging. Enjoy! Happy Thanksgiving everyone! If you’re busy cooking today, check out our post from earlier this week on red & white wine sauces to go with your turkey and choosing wine for your Thanksgiving meal, or run through the wine & turkey or holiday tags for even more ideas! Aging wine in oak barrels is expensive. A single, 55-gallon barrel can easily cost more than $1,600. Barrels made from oak found in the forests of Allier, Nevers, Limousin, and central France are worth even more. What makes these barrels so costly? Are wineries paying for the quality of wood, craftsmanship, or both? The answer is: both; wineries pay for exquisite craftsmanship plus the flavor-enriching properties of good wood. Because every forest (Allier, Nevers, Limousin, etc.) produces wood of unique, variable density, oaks from a given forest impart a wine’s flavor and aroma with that forest’s distinct nuances. Because French oaks tend to have a tighter grain and a less watertight nature, coopers split the wood along the grain. American oak is often serrated, allowing more of the tree to be used (thus, it’s better for eco-conscious folks). 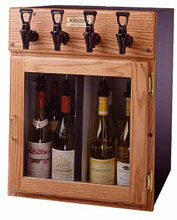 American oak also provides quick oxidation–relatively speaking–which allows wines to soften faster. It produces wines rich with tannins and textures that are sometimes considered to be a bit too “raw.” French oak, on the other hand, produces wines containing more refined tannins, and with slightly sweeter fruit-like flavors. Sometimes, however, wines from French oak can be a little too subtle. Scents of peach and rose are often present in wine because of French oak, while stronger fragrances like vanilla are more common in wines from American oak because the wood contains up to four times the number of lactones. What is very exciting is the growing trend of blending wines aged in both American and French oak. Is there really such a noticeable difference from blending the two oaks? Actually, there is, and wine produced from this dual incubation is curiously impressive because of what each oak offers. The aging and combining of wine from both barrels is an attempt to literally capture the “best of both worlds.” Has it been successful? According to numerous tasters, it certainly has! If you’re curious, the next time you’re out and about, keep an eye open for wine aged in both French and American oaks. Have a sip, and see if you can taste the unique result! Cheers! Did you know that California is the 4th largest producer of wine in the world? The three top manufacturers are France, Italy, and Spain. When aged, red wines often fade, eventually turning a rusty, brick red color. White wines, however, become more golden with age before darkening to brownish yellow. The Prologue of the Code of Hammurabi. The Code outlines punishment for fraudulent wine sellers. When a wine is paired with food, the food and wine have what is called “synergy.” This is an additional flavor that the food or wine, if consumed alone, does not have. Approximately 55% of wine consumed in restaurants is red wine. European wines are given names based on their geographical locations, while non-European wines are named after grape varieties. One of the oldest known literary works, the Epic of Gilgamesh, features wine prominently; the goddess, Siduri, is symbolic of fertility, as well as fermentation (wine). Women are often better wine tasters than men; their sense of smell is often keener. 1,000 lbs. of grapes will make about 60 cases of wine, or 720 bottles. A single bottle of wine contains close to 3 pounds of grapes! Hippocrates, the “father” of medicine, used wine in almost all of his remedies. He used it to alleviate fevers, prescribed it as a diuretic, and utilized it for its antiseptic properties. Hammurabi’s Code (1,800 B.C.) features a law to punish fraudulent wine merchants: drowning in a river! When wineskins were used to hold wine in ancient times, the skins were cleaned, tanned, and turned so that the hairy side was on the inside, making contact with the wine. Today, wine grapes take up the most acres of all fruit crops planted in the world. The Vikings called America “Vinland” after finding numerous massive, native grape vines growing there around A.D. 1,000. A typical glass of dry red or white wine contains 110 calories. Sweeter wines have more. For additional wine trivia and insights, check out the Vintage Cellars Wine Storage Education Center. Cheers! Residents of the East Coast recently experienced the wrath of Hurricane Irene. For the fortunate individuals who did not incur serious property damage and flooding, there were other issues to contend with: power outages. 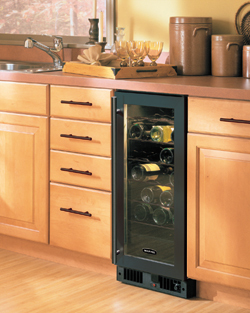 Some storms can leave areas without power for days, meaning your wine cooling units will not operate. And who wants to see a multi-thousand dollar investment ruined because of a power outage? Aside from hooking your wine cooling units up to a generator, which is an option only if your personal survival is not dependent upon the same generator, there are a few things you can do to keep your wine safe (if you can still access your cellar!) If you own a wine cabinet, like the Vinotheque Wine Reservoir, or a N’Finity two temperature cooling unit, obtain a large block of dry ice and, while wearing work gloves, wrap it in clear cellophane (plastic wrap.) Position it just above the top of the unit, and your wine will remain cool for about two days. If most of your bottles are racked and you don’t have a wine cabinet, choose your most valuable wines and stand them upright in a large cooler or plastic storage tub. Fill the container with ice. Drain and re-ice as necessary. (Standing the bottles upright is okay in this emergency situation. It helps minimize water/ice damage to labels, and also keeps the corks from being exposed to a fast temperature change.) If your wines do happen rise above their typical storage temperature, they will age a bit quicker than anticipated. This may mean that some will be ready to drink much sooner. Keep this in mind when restocking them after the disaster, and consider using bottle tags to mark any questionable wines. This way, you’ll remember to enjoy them before it’s too late. What’s the Optimal Wine Storage Temperature? As we’ve discussed in previous blogs, the temperature at which a wine is stored (and served) can bring out the best (or worst) of a given bottle, but an entire wine collection can be at stake if “ideal” storage temperatures are not maintained. Many big collections have been unnecessarily damaged because of such unstable temperatures. For example, temperatures above 65ºF encourage wine to age too quickly, causing their flavor and balance to suffer in the process. Contrariwise, cellars that are too cold cause wines to lose their characteristic aromas and flavors. Rapid temperature fluctuations, too, can damage a wine’s cork and, thus, the wine as well. If you don’t want to see your wine collection ruined, it’s a good idea to invest in a decent wine cellar or specially-crafted wine storage cabinet. 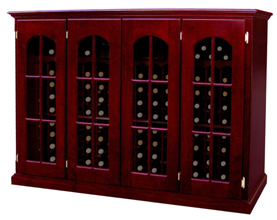 Stylish wine cellars can be built easily and affordably using designer wine racks or traditional redwood wine racks. 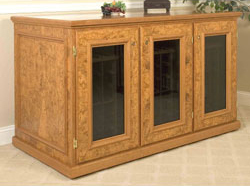 Wine storage cabinets, like regal wine credenzas, also offer affordable (and classy) options. Remember to store wine horizontally to keep the cork moist, and never freeze a bottle of wine! When stored properly, and at the ideal temperature, your wine collection will age gracefully and provide anticipated delight. 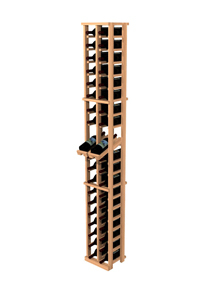 Want to learn more about the correct storage conditions for your wine? Head over to the Wine Storage Education Center to read more about temperature, humidity, cooling systems and more. We’ve even done separate articles on the right storage conditions for red wine, white wine and sparkling wine/Champagne. Summer is in full swing! And during the summer, increased temperatures often cause wine cellar cooling units to work longer and harder hours. While most cooling units are expected to last five years if running continuously, the majority of cooling units (those run only when needed) function for many, many years beyond this grave estimate. However, the time may eventually come when you will need to replace a cooling unit in your wine cellar or cabinet. How will you know when this is so? There are three types of cooling systems, each with their own particular design: through the wall (e.g. CellarCool CX Cooling Units), self-contained/ducted (e.g. Wine Guardian Fully Ducted Systems), and split systems involving a condensing unit and fan coil (e.g. WhisperKOOL Split System Cooling). If your system is not operating properly, first refer to your owner’s manual. You’ll often find a tip in the “troubleshooting” section that will miraculously solve the problem. If the problem persists, clean your cooling system while referring to the same manual. For through the wall systems, vacuum and clean the vents. If this does not fix the problem, or if you have a split systems or self-contained/ducted one, you may need to call your local HVAC contractor to come out and test the coolant, pressure level, and provide general service to the system. They’ll also make sure the issue is really the cooling unit and not a problem with the thermostat, especially if there was a recent power outage. For wine cabinet cooling units: Many times you can purchase replacement cooling units made specifically for the model of your wine cabinet. This allows you to replace them easily, without having to fuss with modifying a cabinet. Although cooling units can last for many years, it’s a good idea to have them tested and serviced every year. This way, they will keep running as efficiently as possible, and will oftentimes last longer than if they were never serviced. Just like taking your car in for routine tune-ups, giving your cooling unit yearly “check ups” helps it stay in tip-top shape. If you think your cooling unit might be ready for retirement, give the Vintage Cellars wine storage experts a call. They can help you figure out whether you need to replace the unit, and if so what cooling system will best suit your needs for the future. Even in wine cooling, new technology happens all the time! So the unit that has served you well for years may actually be inefficient (ie, expensive to run!) 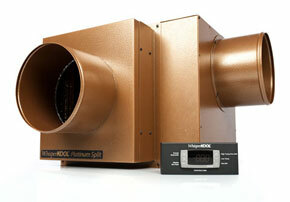 or noisy in comparison to the up to date cooling systems available.